Illinois.Who Needs a Commercial Drivers License? You must be age 18 to apply for a Commercial Driver’s License (CDL) to drive in Illinois and age 21 to drive outside Illinois.You must obtain a CDL if you operate. Any combination of vehicles with a Gross Combination Weight Rating (GCWR) of 26,001 pounds or more, providing the Gross Vehicle Weight Rating (GVWR) of the vehicle being towed is in excess of 10,000 pounds. Any single vehicle with a GVWR of 26,001 pounds or more, or any such vehicle towing another not in excess of 10,000 pounds. Under state and federal law, certain drivers are not subject to the requirements of the CDL program.The Federal Motor Carrier Safety Administration has determined these exemptions will not diminish the safe operation of commercial vehicles on the highways. Although the following vehicle operators are not required to obtain CDLs, they are required to hold the proper driver’s license classification for the type of vehicles they are operating. 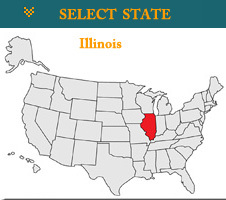 Take the knowledge test at your local Illinois BMV.You must pass this test and then get an Illinois CDL permit.A learner’s permit allows drivers to operate commercial vehicles while supervised by a licensed Illinois truck driver or other CDL driver. Air Brakes Further testing is required is required if the vehicle is equipped with air brakes. An “L” restriction is placed on a CDL if an individual is not able to operate a vehicle that is equipped with air brakes.To qualify to operate a vehicle equipped with air brakes, an applicant must successfully pass the written air brake test and take the CDL skills test in a vehicle equipped with air brakes. To remove an “L” restriction from a CDL, an air brake written test and a drive test in a vehicle equipped with air brakes are required. Complete your training.You will then need to take a hands-on skills test that includes driving on the road. You must provide a vehicle for testing purposes. Generally, you can arrange for a vehicle and testing through a truck driving school or employer. Otherwise, you may need to rent a truck or other commercial vehicle from a CDL rental agency. You must be able to read and speak English well enough to read road signs, prepare reports, and communicate with the public and with law enforcement. The Act established three separate classes of commercial driver’s licenses. Every state issues licenses in these categories: Class A:Any combination of vehicles with a gross vehicle weight rating (GWVR) of 26,001 lbs or more, provided the GVWR of the vehicle(s) being towed is in excess of 10,000 lbs.